At Alliance Ag Equipment, we make it our business to understand your business. We are your full line dealer for high quality agricultural equipment, including both new and used farm machinery. We back our equipment with a full selection of ag parts and a parts and service staff committed to getting you back to work faster. Also, our experienced sales team can help you find the right ag equipment for your operation. Alliance Application Equipment, LLC was formed in August of 2006 by Alliance Ag, GVM Inc. and Gordon Bruff. Located in Troy, TN , Alliance was awarded the AGCO Ag-Chem dealership in 2007 for their successful marketing and support of AGCO SpraCoupe and Willmar products. 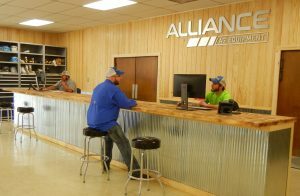 Due to its service-oriented approach, Alliance grew to become one of AGCO’s top-performing application equipment dealers in North America, adding locations in Forrest City, AR, Sikeston, MO and Jonesboro, AR . In 2016, AAE added high-performance tractors to its equipment lineup, evolving into a full-line dealership and expanding its customer reach. With this came a complete rebrand, and Alliance Application Equipment became Alliance Ag Equipment. AAE also expanded its footprint by building a new corporate office in Union City, TN. Over the past 12 years, Alliance has grown from only one location and eight employees to four full-service locations, a corporate office and over 50 full-time employees. As we continue to expand our territory, product lines and customer base, we stay true to our roots by providing superior support and establishing long-term relationships with our customers – relationships built on trust, integrity and respect.